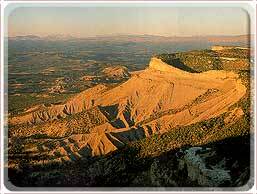 Mesa Verde is located in southwestern Colorado midway between Cortez and Mancos off US 160. From the highway to the park headquarters is 21 miles and about 45 minutes. About 15 miles from the highway is the Far View Visitor Center and 4 miles from the highway is Morefield Campground. The road leading up to the park is a very scenic road but it also has sharp curves and steep grades so remember to only park in designated areas. You will absolutely love the drive from Cortez up the mesa to the National Park. It is very scenic and beautiful. Also the drive from Durango or other surrounding cities is scenic and will go by fast, so keep your eyes peeled and enjoy. 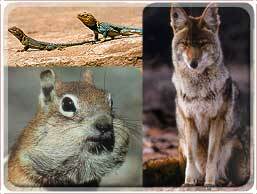 You will love the wildlife as well as the rocks and foliage. We have been blessed with a fair amount of moisture the past couple of years and it has made our high desert landscape very lush and beautiful. If you're flying to the Southwest, there are daily scheduled flights into Durango, Cortez, as well as Farmington, New Mexico. All three towns have rental car services. The closest railroad terminals come into Grand Junction, Colorado and Gallup, New Mexico and both of those have buses running to Cortez as well as rental car services. 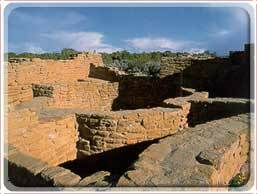 When you arrive at Mesa Verde, the first thing you should do is visit the Far ViewVisitor Center which is open during the summer (early June through Labor Day Weekend) or the Chapin Mesa Museum which is open 8am-6:30pm during the summer and 8am-5pm during the rest of the year. The Visitor Center features exhibits that focus on the contemporary American Indian cultures in the Four Corners area. You'll also find books and postcards at the bookstore. From there a park ranger can help you plan getting the most out of your visit. He'll give you the choice of visiting Chapin Mesa or Wetherill Mesa. Click Here to view maps of Chapin Mesa and Wetherill Mesa. 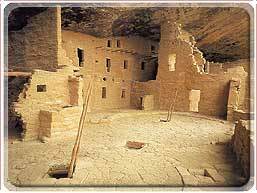 Experience the world of those early inhabitants of Mesa Verde with professionally-trained tour guides. Ponder why people came here, and how they flourished within this challenging, high desert environment. Learn how social and religious structures developed into life ways still followed by contemporary Pueblo an peoples across the Southwest. Compliment your understanding of today's cultures with valuable insights about the past. 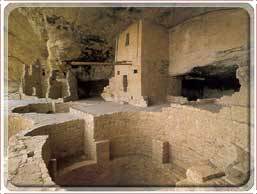 Mesa Verde was originally set up as an archaeological preserve so hiking within the park is restricted to the six marked and paved trails. These are: Knife Edge Trail, Prater Ridge Trail, Point Lookout Trail, Spruce Canyon Trail, Farming Terraces, and Petroglyph Point Hike. All the trails vary in length and level of ability. Some are seven miles long, some are steep and some require climbing ladders to get into the dwellings so make sure to check at the Visitor Center to find the trail that best suits your ability and time limit. The only camping available in Mesa Verde is Morefield Campground which offers 400 sites on a first-come first-served basis. It is open from mid-April through late October. The Campground is only four miles from the park entrance so it's very convenient. Also, nightly presentations are given by park rangers in the large amphitheater in the upper part of the campground. During the winter, none of the roads within the park are plowed except for the entrance road to the Visitor Center so everything else is open to cross-country skis. This is one of the best way to see the sites. There are also places to ski in Morefield Campground or the scenic six mile trail along Ruin Road's Balcony House Loop. 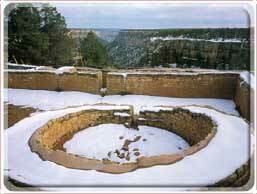 Fall and winter in Southwest Colorado is very unpredictable so tours aren't scheduled during this time but the Archaeological Museum and the Spruce Tree House are open all year. If your coming during the fall or winter, it is advised that you call the park first to check out what's open and what weather conditions are. 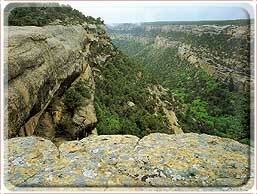 Mesa Verde is packed full of animals including golden eagles, coyotes, mountain lions, tarantulas and bullsnakes. While touring the sites, you'll stand a good chance of seeing rock squirrels, rabbits or any one of the 200 birds that make their home at Mesa Verde National Park. For more information, Check out our Frequently Asked Question page.